The Youth Garden Project operates under the leadership of the Food Gardening Specialists of the UC Master Gardener Program of Sonoma County. The purpose of the Youth Garden Project is to support the development and maintenance of sustainable gardens in school and after-school programs in Sonoma County. 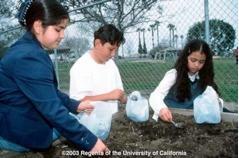 Food Gardening Specialists provide expertise and consultation to school and after-school programs. Services include, but are not limited to, site evaluation, gardening needs advice (location, soil, irrigation, storage, fencing, tools, etc. ), vegetable gardening planning, plant selection and resources and networking assistance. When appropriate, specialists conduct garden demonstrations to school staff, parent volunteers and children with teachers present. Master Gardener volunteers are fingerprinted and subject to a background investigation by the California Department of Justice. Consultation and advice provided to gardens is science-based and consistent with the gardening practices of the University of California Cooperative Extension. Schools interested in project participation must identify, in their application, a key individual to champion and sustain the school’s garden program.